George was born on 28 October 1813 at Donoughmore, Cork, Ireland. He married Agnes Drake, also from Ireland, circa 1841. Agnes died in 1858. They had 11 children. George died on 9 August 1885 at Birkenhead, Cheshire. Kendall relates that whilst at Preston, 1864-7, George headed 127 stalwarts who refused to pay the Easter Church Dues, and secured their abolition. Easter Church Dues were paid to the Anglican clergy. 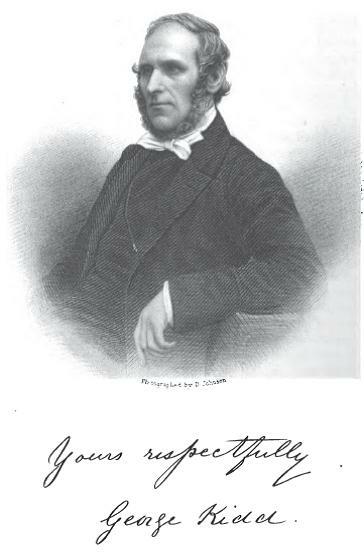 In the Primitive Methodist Magazine of 1838, George wrote of an incident that for him asserted the providence of God. He was on his way to an appointment when a large dog drew close. He couldn’t shake the dog off. About four miles later, dog still at his side, he came across two men. The dog ensured he passed safely. A further two miles up the road, he came across another large dog that was usually chained up. Again the dog saw George past the danger. The dog left him 50 yards up the road!